FINAL UPDATE, 6:30 P.M.: Thank you to everyone again for riding our buses and trains today — and for your patience. No one really knows how many people attended the Women’s March in downtown Los Angeles but the LAPD is reporting that turnout well exceeded 100,000 and organizers are saying it could have been 750,000. As I noted earlier, we don’t have a ridership estimate at this time. As you’ll see in the photos below, many of our trains were about as packed as they can get. With trains added during the day, it also seemed that the outbound trips from DTLA went a little smoother. Both my colleague Anna Chen and I encountered a lot of riders and we appreciate how good natured most riders were with the delays. UPDATE, 2:20 P.M.: Buses and trains will be crowded for those riding home from today’s march in downtown Los Angeles. Trains were added earlier on the Red Line, Blue Line and Gold Line. But the march today drew a huge crowd and you may have to wait to board trains and buses. As of 2 p.m., there was a line for the Gold Line that extended into the pedestrian tunnel at Union Station. The L.A. Times is reporting an estimate of 500,000 attendance. Just to put that in perspective, downtown L.A. had about 290,000 jobs in 2013, according to the California Employment Development Department. UPDATE 9:55 A.M.: Expect long lines to purchase TAP cards and board trains and buses at many stations and stops. UPDATE, SATURDAY 9:10 A.M.: Extremely large crowds are descending on downtown Los Angeles for today’s march. We’re experiencing very heavy crowds at some Metro Rail stations with passengers waiting to board trains. Your patience is appreciated. Again, we emphasize: fares are not free today. Please pay the appropriate fare when boarding Metro buses and trains. For updates, please follow us on Twitter. UPDATE, SATURDAY 8:30 A.M.: We’re seeing a ton of riders this morning and all Metro Rail trains and many buses headed to downtown are crowded. We’re also seeing some people say on social media that fares are free today. They are not. Please pay the appropriate fare. And thank you for your patience. Inauguration Day will be taking place on Friday, Jan. 20, and media reports indicated there are several marches planned in the DTLA area Friday that may trigger street closures and impact traffic and Metro Bus service. The Women’s March is also scheduled to take place in DTLA on Saturday, Jan. 21. So…whether you live/work/play in DTLA , plan on attending the marches, protesting the marches or are a completely indifferent bystander who just wants to get where s/he is going….we recommend Metro Rail as a good alternative to gnarly traffic and expensive parking. Street closure map of #Inauguration Day marches for Friday in Downtown. Closures begin at 9AM. 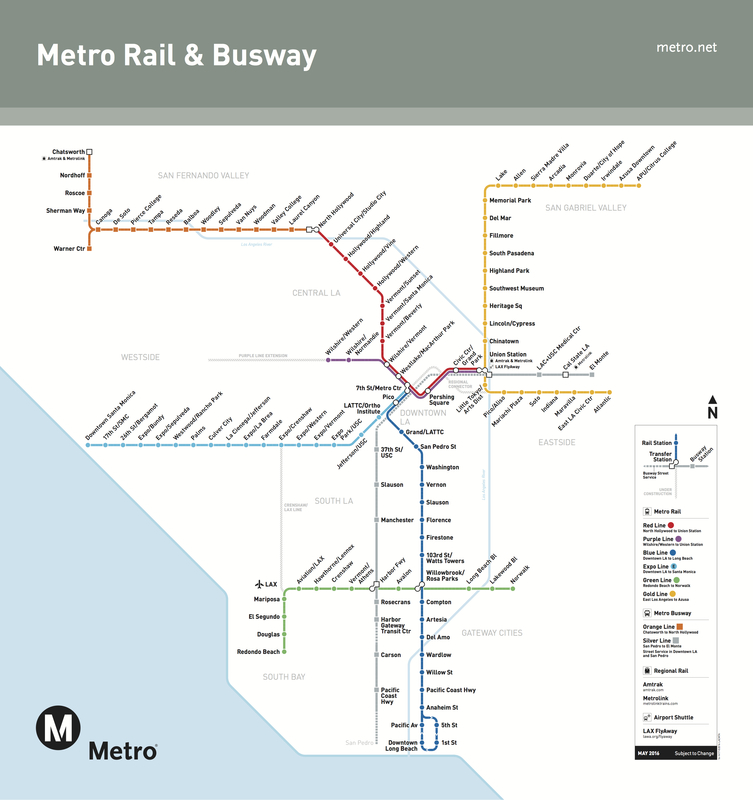 DTLA is served by five Metro Rail lines: the Red/Purple Line subway (Civic Center/Grand Park and Pershing Square), the Blue Line (Convention Center, Staples Center, L.A. Live and 7th & Figueroa), Expo Line (same as Blue Line) and Gold Line (Union Station, Olvera Street and Mariachi Plaza). The system map is above. If you’re planning to park and ride, here are your options. 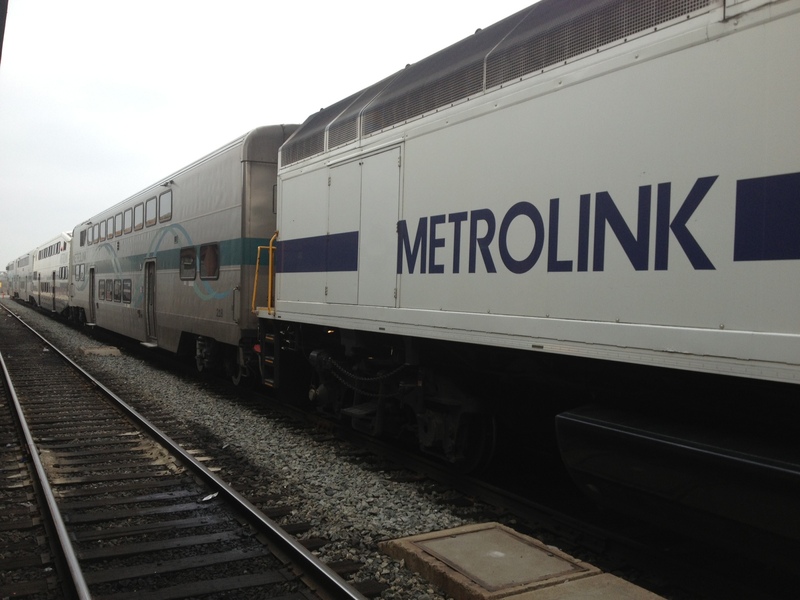 If you’re coming in from further away, Metrolink may be an option for you. Service to Union Station in DTLA is available on the Antelope Valley, Orange County, 91 and San Bernardino lines. From there, you can transfer for free to Metro Rail to reach your destination. Please check Metrolink’s website for train times. 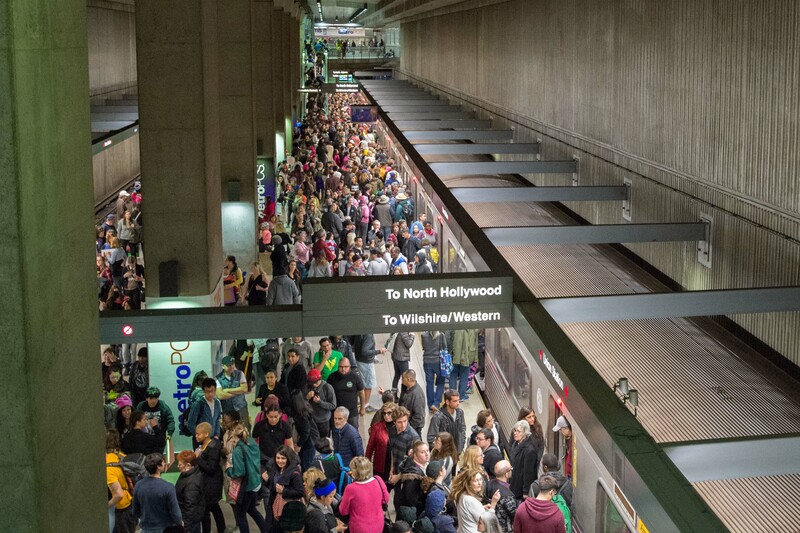 On Saturday, Jan. 21, Metro Rail will run enhanced service from 8 a.m. to 6 p.m. with the Red, Purple, Blue and Gold lines running every 12 minutes, and the Expo Line running every 9 minutes. There will also be longer trains on Expo, Blue, Gold, Purple and Red Line in anticipation of large crowds. Use the full platform to board. If you have a bicycle or stroller, please use the designated open space on board each train car. We also recommend loading your TAP card before you start your trip. Roundtrip fare is $3.50 in stored value and can be added online at taptogo.net or at TAP vending machines. A Day Pass is $7. Please note: each person must have their own TAP card. Two children under age 5 may travel free with each fare-paying adult. Buses will be detouring due to the planned marches (see details for Jan. 20 here and Jan. 21 here) and some lines may be delayed due to heavy traffic around DTLA. If you are traveling through by bus or car, please allow extra time. We will provide live updates on service detours and park and ride availability on Twitter at @metroLAalerts and @metrolosangeles. 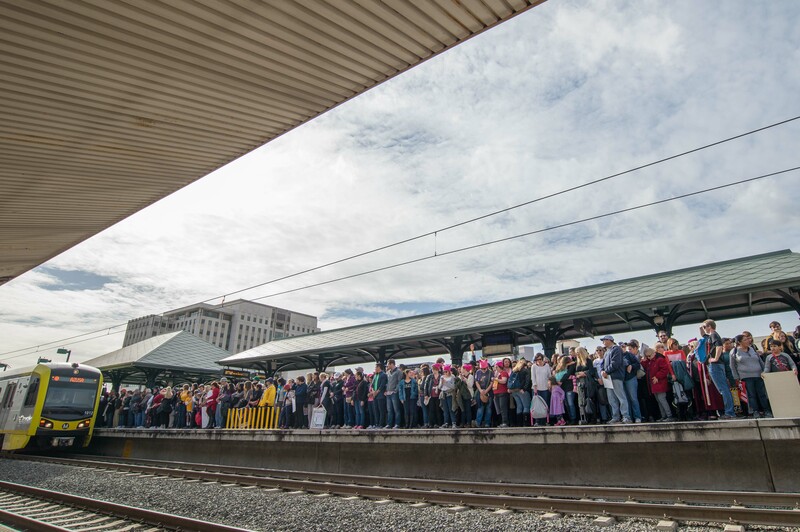 For everyone’s safety, Metro staff will be monitoring crowd levels at rail stations. And, as always, a reminder to be careful around buses, train platforms and train crossings. If walking through rail crossings, please obey all signals and cross the tracks safely. What about the Saturday maintenance on the Blue Line? Has that been postponed? This would not be good if huge crowds were stuffed onto trains running every 20 minutes. Maintenance has been cancelled on all lines Saturday in anticipation of expected crowds. I know that many participants from the South Bay are hoping to take Metro to get to Pershing Square; they either will do this by taking the Green Line to the Harbor Freeway transit station and transferring to the Silver Line, or driving to the park-and-ride lot at the Harbor Gateway Transit Center and taking the Silver Line. So here is my question: Does Metro have any plans for enhanced service on the Silver Line ?? And do you know where the Silver Line stops will be around the Pershing Square area? The Silver Line usually stops at 5th and Olive directly in front of Pershing Square, but will this be diverted to a different street because of street closures ? And will the southbound Silver Line still have a stop on 5th and Grand, or will this be diverted as well? And just a bit of finger wagging: Metro lists the Silver Line as one of its major transportation options on regional maps, but, as shown here, overlooks the people who rely on the Silver Line in unusual circumstances like this one. For many people in the South Bay, this will be their first experience with using Metro, and we should try to make it as seamless and nonfrustrating as possible. At this time there are no plans to increase Silver Line service. We may have more updated info later this afternoon. If you do plan on taking the Silver Line, it may be best to take it to either Union Station or to 7th/Metro and transfer to rail, or use bike share. The Silver Line will be on detour around Pershing Square due to expected barricades. Another thing that Metro could do to ease congestion is to remind Metrolink ticket holders that their paper tickets will work as valid fare on Metro and LADOT buses as well as they can unlatch the turnstiles for rides on the Red/Purple Lines. Any plans for TAP ambassadors to be present on these days? Signs stating that every Subway train does stop at Pershing Square would also help. Can I buy a DAY PASS the day before I want to use it? Yes, you can. You can load a Day Pass on your card in advance, and it will be good from time of activation until 3 a.m. the next day. Please note the pass will be activated once you TAP, so plan your trips accordingly. Is there WiFi on the trains to be able to access the Go511 app? Glad you are running extra trains. I have waited almost an hour for the local bus today on route 70/76/770. I understand there is a major event in Downtown, but this is not an excuse for delaying the buses and letting them running excessively behind the schedule. That’s Unacceptable for not running addition services for those routes from/to Downtown as well as the Silver line. Please address it next time when there is an major event again in Downtown. Routes back to regular schedule Sunday? Without a doubt, the MOST amount of people I have ever seen on the system. I took the Red from Universal up to NoHo at 7:30 to meet friends and had absolutely no issue. That’s when I was first informed the rides were “free”. Still confused as I totally went through the turnstile and didn’t need to tap. Waited for friends at NoHo until 8:30 when it was impossible to enter the NoHo station. It was AMAZING. 90 minutes later of pushing through people, and waiting while train after train entered and left the station full without loading any new passengers, an empty car arrived and the cheers on the platform were life-changing. Overall, even despite the hiccups, the mood was very positive and I heard many MANY first timers on the rail. AMAZING experience, not just for the march, but for the entire MetroRail. Thanks to you for all the service to Blue Line riders – trains came quickly, and we were told we could just board without using our TAP cards to speed things up. I’ll certainly be using it soon! On my train a woman had a seizure, and help was quick and professional. Holy Crap! I just read about the huge lines. Did Metro encourage protesters to hang downtown and enjoy a soda pop, a movie or dinner? That might have taken down the crush. (I’m a little claustrophobic so I think about these things). 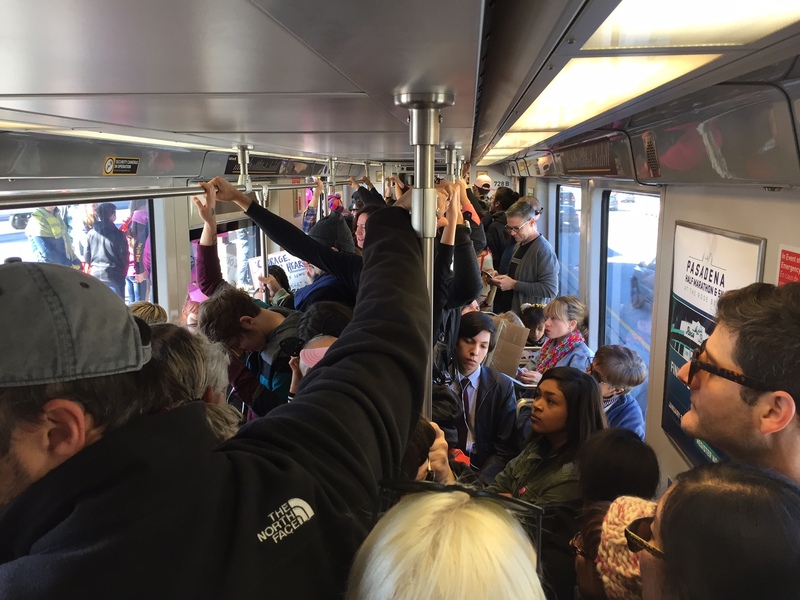 Between the passage of Measure M and the huge number of riders on Saturday it clearly shows that Los Angeles has finally accepted mass transit as an alternative to the automobile.